The Predator. Can you see him? It’s been over 30 years since one of cinemas most iconic aliens first graced our screens. 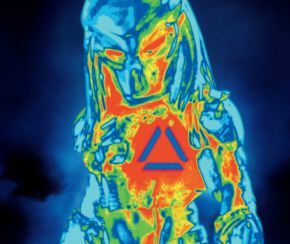 This year, Shane Black attempts to bring the franchise back to prominence with the latest adventure, The Predator. The Predator is the sixth movie to feature the alien hunter and is set in the modern day suburbs. It’s a direct sequel to Predator 2 (1992) and sees a secret government organisation called Project Stargazer attempt to capture Earth’s latest visitor, who just so happens to be pursued by another and much bigger Predator. Boyd Holbrook (Logan) leads a team of quirky soldiers, and a disgruntled science teacher (Olivia Munn), who take it upon themselves to prevent the end of the human race. There’s a great chemistry between the characters and their interactions feel believable, something to be expected from writer/director Shane Black (Iron Man 3, The Nice Guys). At the centre of the story is a young autistic boy called Rory, played by the brilliant Jacob Tremblay (Room), who finds some of the Predator tech and gets involved in the hunt. He’s a great character and adds some sensitivity to the film. In terms of story, this doesn’t feel like a Predator movie, with a larger focus on the sci-fi action and battles between the soldiers and the creature, rather than the hunt. The majority of the movie takes place in the small town, but eventually starts to feel like the original during the third act. With a 15/R certificate, this gives the filmmakers a ton of freedom to push the action as far as they can go. This is much more gruesome and violent than some of the previous instalments with some well times comedic moments that would make Deadpool proud. It’s great to see that freedom, but sometimes it can go a little overboard with some very graphic scenes. The movie is edited well with the action making sense and the pacing just right. The only real issue is a few earlier scene involving Olivia Munn’s Casey Bracket, which seem a little choppy. This is unfortunately due to outside controversies, so it’s more understandable. The Predator makes good use of its updated technology, with the effects looking great and fitting the action. But it’s fantastic to see the amount of practical effects being used, with only a few minor enhancements, which helps to ground it. This definitely helps bring the newer creatures to life, including the Predator’s dogs. With Shane Black in charge, this film genuinely has a great sense of humour, with some quick dialogue between the characters and some funny visual gags. This really helps liven the movie up and makes for a fun watch. The score was created by Henry Jackman (Captain America: Civil War), who has managed to honour the original film with a unique soundtrack that stands apart from the rest, while also paying homage to the original and even featuring the original theme. There’s a lot of references to the original too, with nearly all of them being weaved into the plot perfectly and never seeming out of place. Overall, this is a good film that features some great moments. It isn’t the best movie ever made and could have done with some touching up. The characters are by far the best part about this film. But it does feel like it’s trying to start a new franchise which doesn’t quite land. Purple Revolver rating: 3/5. Good, not great.